So I am having this issue. I am working on something that requires me to talk about myself. And when I say talk about my self, I really mean talk myself up. For some people (like a couple of my brothers), this may come easy, but for me, OMG I cannot do it. If you’ve met me in person than you know I am pretty soft-spoken, especially when it comes to me or my work. Like I just do not like to talk about myself. It totally embarrasses me. And if you talk to me in front of my mom? Oh my gosh, that is the absolute worst. She’ll step in and, go on and on… so embarrassing. You see my mom is a master at talking up her kids, she is a well seasoned pro I tell ya. I am still at the point in my life where I cannot even accept a complement without feeling awkward. I know it is totally weird, but I guess I am still growing into this whole adulthood thing. I do have to say that I have learned that when I do receive a complement I need say thank you, smile and act like I can own it. It’s worse when you try to brush it off because then you get more compliments and then my face gets all red and flushed and then they know I am embarrassed. So now I just nod along and say my thank you’s. Hey, maybe I am learning and growing… just slowly. Anyway, I spent my Saturday trying to talk about myself. It was the first day I had not cooked and photographed in so long…it wasn’t all that fun. Sitting at a desk is just so not for me. I get too distracted. Towards the last hour or so, I just couldn’t focus anymore. 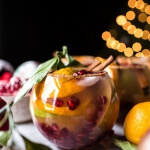 I had been working at my computer for six plus hours and at some point during the last hour, my mind drifted towards Christmas. For all you Christmas haters, you should just stop reading now and skip down to where I am going to talk about this soup. For the rest of you, I have crossed over to full on Thanksgiving and Christmas mode. I have always loved the holidays, especially Christmas, but this year feels different. I am thinking that maybe it’s because it has been such a stressful and busy year (good busy!). I think I just need something to cling to and get excited about. As much as I love my work, I need another release to help me relax. I am pretty sure most of you can understand, and for me, the one things I can really get into is the holidays. So this upcoming season has me pretty excited to say the least. Plus, if all goes well, my big GC (general contractor) of a mom is telling me the barn will be move in ready come the first (or second) week of December. I have to say, I am highly skeptical. While the barn is certainly looking more finished, there is still boatloads to do in three to four weeks. Still hoping for three though! I obviously want to have plenty of time to decorate for Christmas. And don’t worry I have been a little better about getting down to the barn to take photos the last couple of weeks, so when all is done I can show you guys a little bit of the process. But back to that last hour of computer work, yeah I totally spent most of that last hour scouring all my favorite cooking sites looking through their Christmas collections. It was so fun… too bad I couldn’t actually buy anything because um, my budget’s a little tight ever since this whole barn project decided to go and get all pricey (like a lot pricey) on us. Ugh. Reality. Our weather is apparently supposed to turn pretty cold here this week so I made us all some soup. I mean, it is soup weather after all. This isn’t any old soup though, and I have to say that I am hoping you will serve this as a first course at Thanksgiving. It’s picture perfect for Thanksgiving. ESPECIALLY if you take the time to cut the acorn squash and pie pumpkins into cute little soup bowls. This may be one of my favorite things to do on Thanksgiving, it’s so fun and people kind of get all impressed by them, which works out as bonus points for you, obviously. This is such a simple soup, but it’s packed with spicy, sweet flavors. The pumpkin soup itself is chipotle cheddar and I swear that pumpkin, chipotle and cheddar is one of the best combos. I have even done it on pizza (with bacon) and it’s just so good. If you are worried about it being too spicy, you can just reduce the amount of chipotle. To be honest though, I wouldn’t worry about the spiciness too much. The creamy, cheesy soup helps to mellow out the spicy flavors. 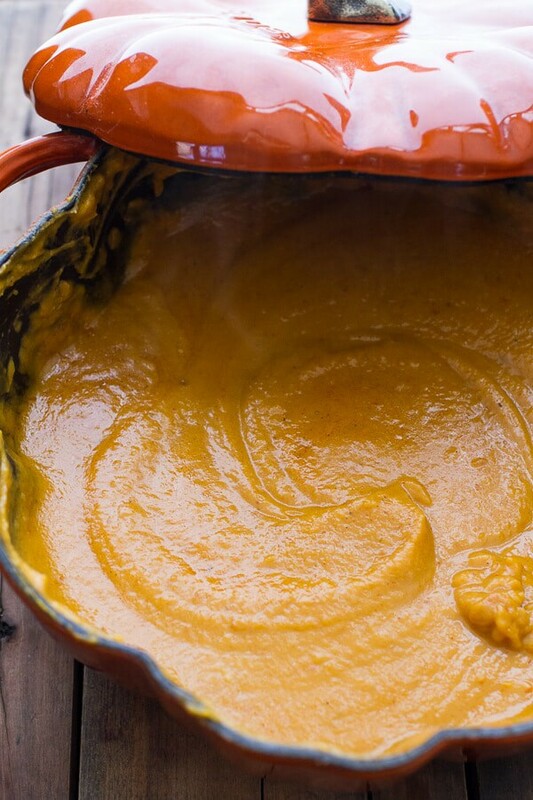 My favorite component to this chipotle pumpkin soup is the topping. I am such a huge fan of good chorizo. I say good, because not all chorizo is equal, and if you can make you own, well, more power to you!! The chorizo is the perfect topping and adds bits of texture to this otherwise textureless soup. Oh, and the apple? I know this may seem totally odd, but the sweetness of the caramelized apple plays off those spicy flavors in the chorizo and chipotle. You have to trust me on this. You’ll love the combo together. And if you are still freaked by the apples, just leave um, but I am telling you, you should at least give them a try. It’s not weird! Or maybe it’s kind of weird, but it doesn’t taste weird. Just good. 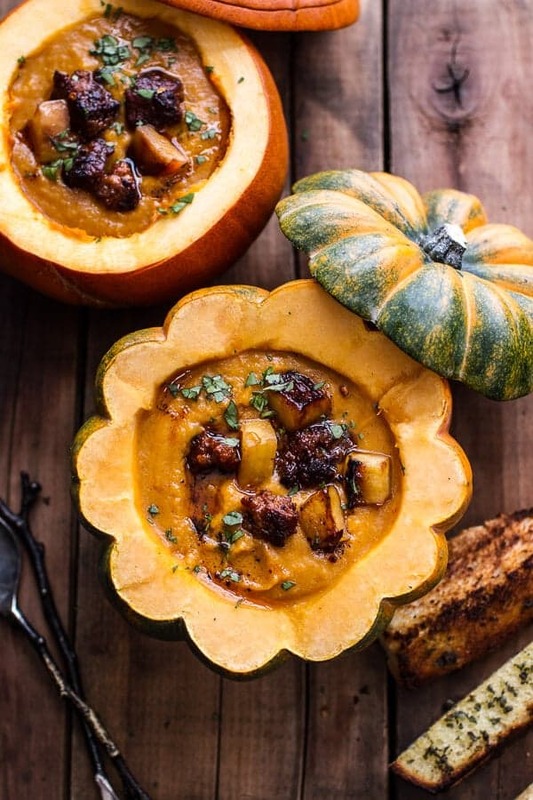 Chipotle Pumpkin Soup with Crispy Chorizo + Glazed Apples. In a large soup pot, melt 1 tablespoon butter over medium heat. Add the onion and cook until soft and translucent, about 5 minutes. Add the garlic and cook anther 5 minutes. Add the chipotle peppers and the two teaspoons adobo sauce, stir and cook another minute or so. Add the pumpkin puree and stir to combine. Pour in the chicken broth, add the chili powder, smoked paprika, cumin, oregano, salt and pepper. Simmer about 10 minutes over medium-low heat. Puree the soup with an immersion blender or transfer to a blender and blend until very smooth. Add the cheddar cheese and cream, stir until melted. Season to taste with salt and pepper. Allow the soup to simmer on the stove for 15 minutes while you make the topping. Heat remaining 2 tablespoons butter in a skillet over high heat. Combine the apple and brown sugar, then cook, turning, until caramelized. Set aside and wipe the pan clean. Add the chorizo and cook for 2-3 minutes until cooked through and crisp. Remove from pan and drain on paper towel, reserving pan juices. To serve, ladle the soup into a bowl topped with crispy chorizo and glazed apples. Drizzle with the chorizo oil left in the pan. Enjoy! 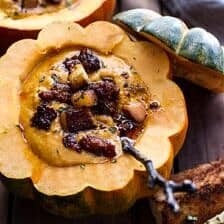 *To make you own pumpkin puree, preheat the oven to 400 degrees F. Cut your own small to medium size sugar pumpkin in half or into fourths and reserve the pumpkin seeds for later. 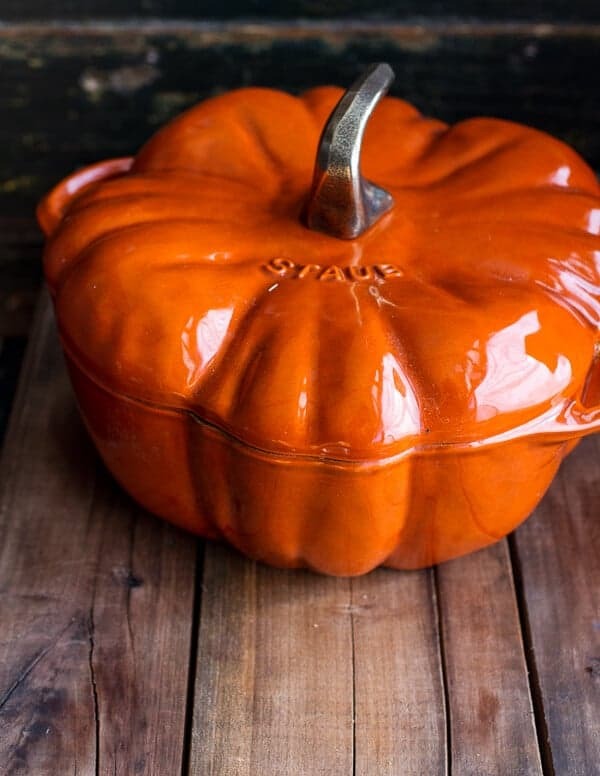 Place the pumpkin on a baking sheet and rub the pumpkin with 1 tablespoon olive oil and sprinkle with salt and pepper. 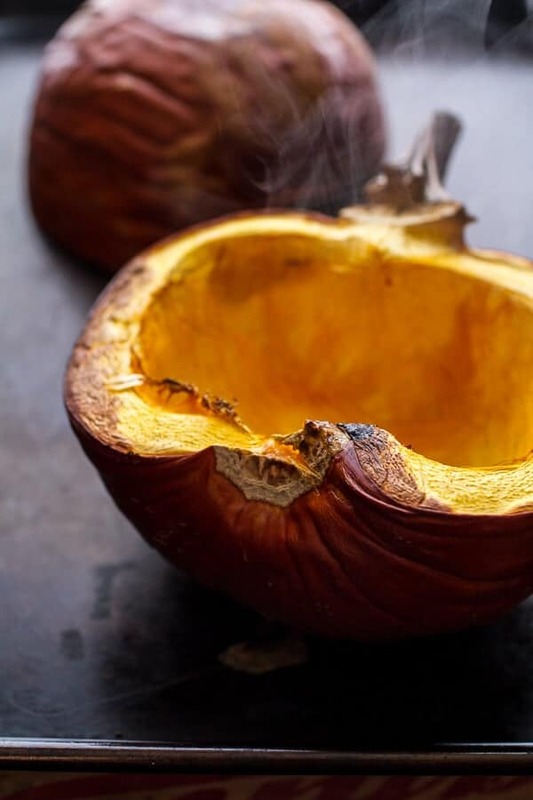 Roast the pumpkin for 45 minutes, or until the pumpkin is fork tender. Remove from the oven and allow everything to cool five minutes. 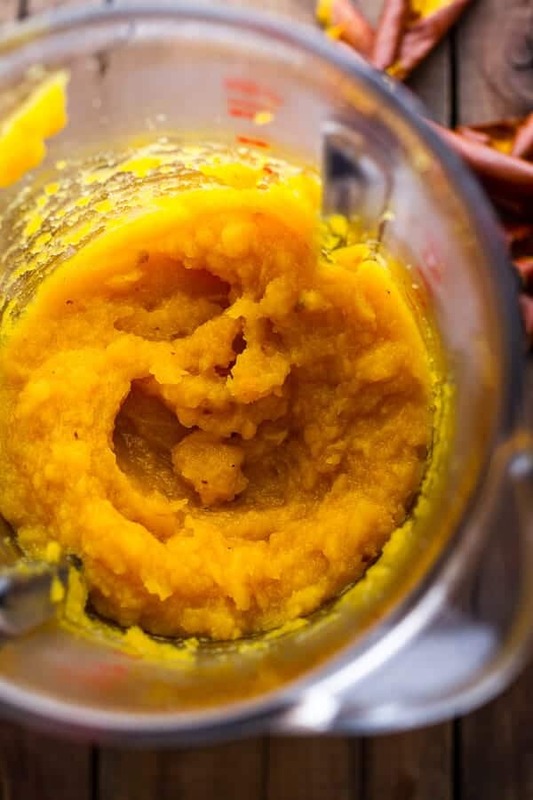 Grab the pumpkin and add it to a food processor (or mash extremely well) and puree with 1/2 cup of chicken broth, puree until completely smooth. I totally understand about having a hard time taking complements and getting awkward. Good thing it’s so much easier to give them because I have to tell you how much I love this soup recipe. It looks so good! Everything about your blog is amazing. I don’t know how you do it! Oh, and I’m so excited for you about your barn project. I hope you get to start moving in in only 3 weeks so you have plenty of time to decorate! AWE! Thank you so much! If you could see me know, you’d see my face getting all red. Haha! Have a great week, Tori! THANK YOU! You are so sweet, Lisa! Hopping you had a great start to your week! Anxious to see the barn pics. Exciting I know!!!! Thank you so much!! Have great Tuesday, Charlotte! AND a soup and chorizo and pumpkin obsessed person. This soup? I want to swim in it!! You’re right, it’s totally soup weather! And this soup looks like the perfect comfort food! 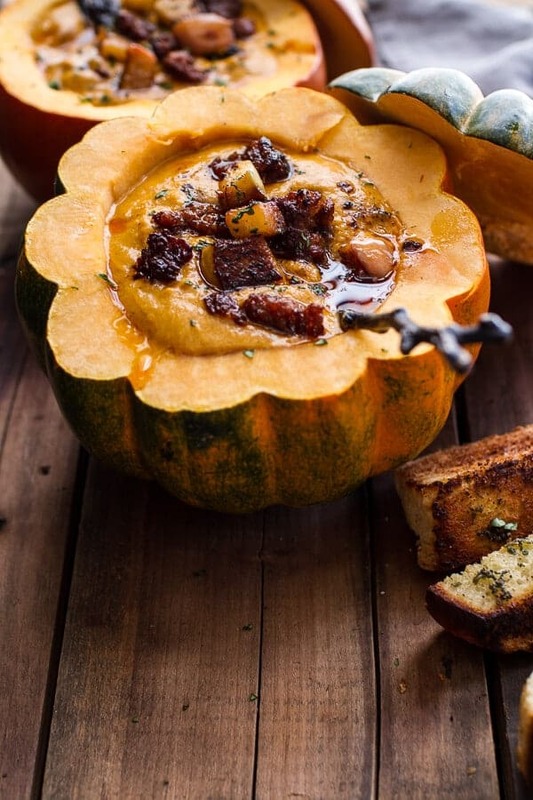 Now I’m totally craving some pumpkin soup with chorizo! Yum! Yeah!! Thank you so much! Have a great Tuesday! 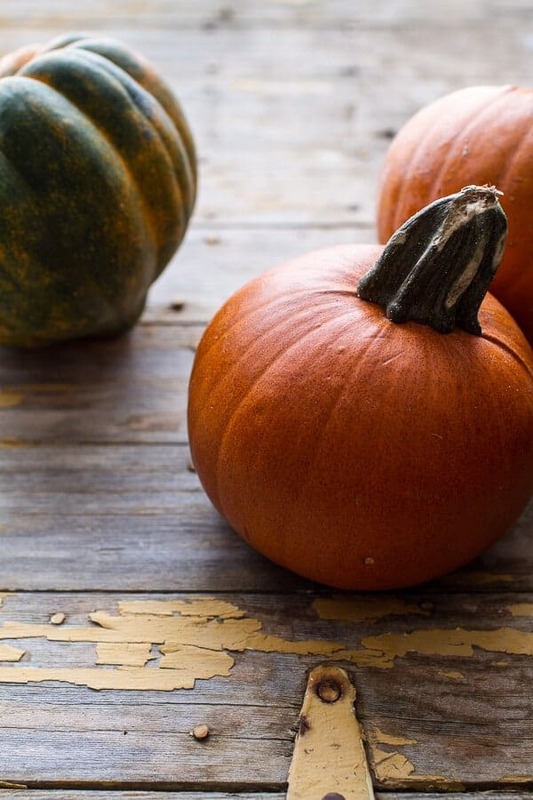 I love this spicy pumpkin soup! So pretty! Thank you so much, Liz!! Hopping you had a great Monday! Holy deliciousness. So much to love about this soup. 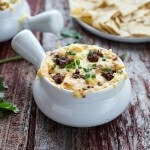 I bet the smoky chorizo goes brilliantly with the chipotle pepper in the soup. 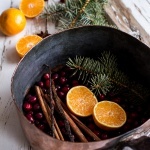 Perfect winter fare! Thank you, Brian!! Hope you had a great Monday! I just love how you served this soup and DAMN this combo does sounds amazing! Need some NOW! Dude, with the crazy cold weather headed this way, I am totally actioning this!! Thank you so much, Lauren!! we just got a whole lot of snow and man it is cold up here. Stay warm in Denver! I used to have the hardest time accepting a compliment too – so totally understand – but live and learn right? Your soup sounds fantastic – love the cumin, adobo chilies and pumpkin combo! Thanks so much, Shashi! Hope you had a great start to your week! so many flavors in here and all playing well with one another. and I agree, people love food served in food bowls. Sometimes, I get a bit flustered when I’m talking about myself, so I know exactly how you feel! This soup though is nothing to be shy about! 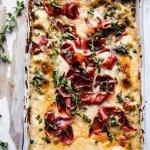 The chorizo and apples in here is such a great touch! Thank you so much, Lisa!! Have a great Tuesday! I am pretty certain that anything with chorizo tastes fabulous! 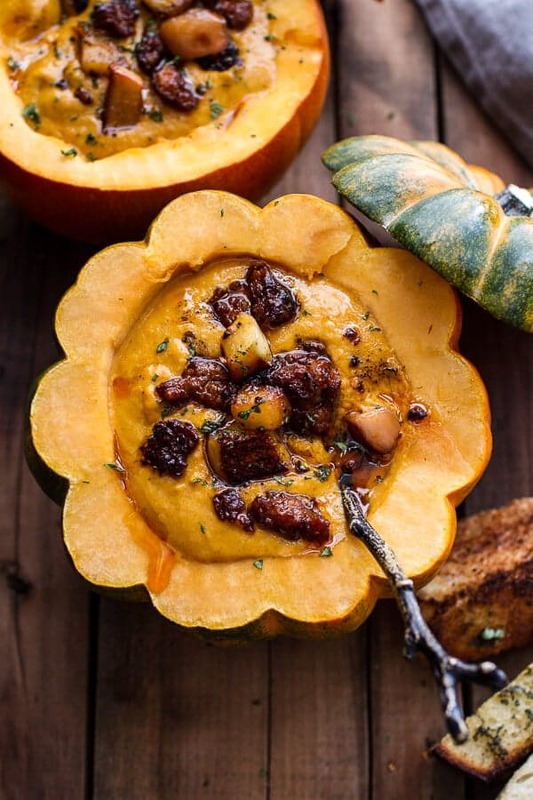 All these components sounds so great together….perfect fall soup! You are a lifesaver! I love these flavor combos and have a baking pumpkin on my counter just staring at me. I didn’t get to do anything with it for Halloween so I think this might be it! Perfect!! hope you love the soup! 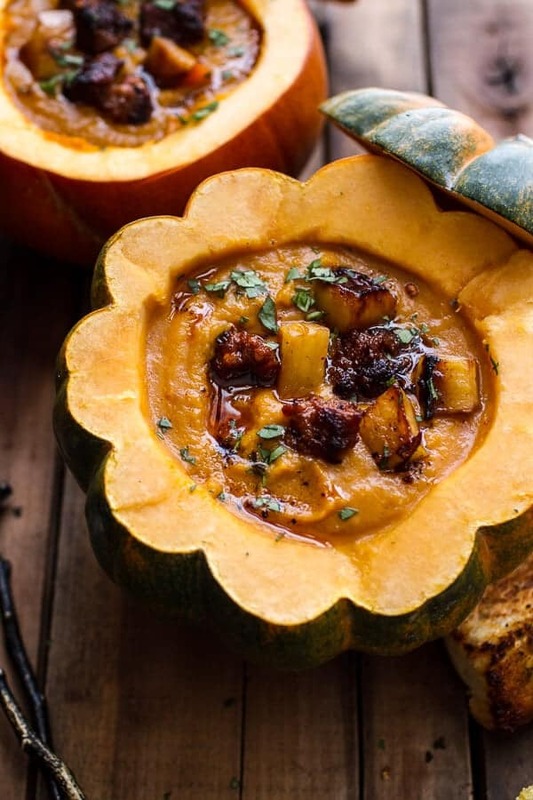 I love pumpkin soup and those squash bowls are just the cutest – love!! Yum! I can’t wait to try this! Wish I had the awesome Staub pot! Wonderful flavor profile, Tieghan. Well done! Thanks Terri!! I love all Staub cookware, it is the best! I’m the same way. I feel so uncomfortable accepting complements that I have a whole list of ways to say “thank you” without actually saying “thank you.” I feel almost rude if I accept the compliment. BUT….when I hear someone else accept a compliment, I always find myself admiring their confidence and poise. I can’t wait to see all your Christmas goodies! Yes, yes, I feel the same way! This looks like pure comfort. Wonderful flavors! Looking forward to seeing your barnyard living quarters/studio! Love the idea of taking something old and rustic and giving it some life. Thank you so much, Katya! 🙂 Have a great week! The cold is coming our way also. This will taste really good if we get the snow this coming Sunday–if not it will still taste great. The grocery store was giving away reject pumpkins the other day, and I took one without any clue what I’d do with it. Lo and behold—you come to the rescue. And just when I was craving soup, too. This is so scrumptious! Since it’s just my husband and me, I sprinkled some of the chorizo on top and planned on saving the rest for the leftover soup. But then my husband dumped the whole container into his bowl. So it looks like we’ll be sans chorizo for the leftovers (of course he was very pleased with his giant bowl of chorizo soup). Thankfully, it’s still super delicious without it. Looking forward to second-day soup—I might go have some right now. YEAH!! I am so exited you made and loved this soup!! THANK YOU! I totally understand the compliment thing. I could Up-talk my boys all day long, not so much for myself thou. Good luck on your barn, sounds like your mom is doing a fabulous job. I just found my first course for Thanksgiving. And Chorizo too? Who does not love chorizo? What amazing flavors, all mingling together. Serving it in the hollowed out pumpkins is a given. Thanks for posting. Thank you so much! I hope you love the soup and happy early Thanksgiving! This looks so delicious. I must have missed the instructions on making the acorn and pumpkin bowls. Do you pre cook them to serve the soup in? If so at what temperature. Thank you so much! Can’t wait to try it!! Thanks Jan!! I actually did not pre-cook the squash because I just used them as bowls. BUT you can pre-cook them at 400 degrees for 30 to 45 minutes if you want to eat them. Hope you love the soup! Ok, so I’m not gonna lie. When I first started making this recipe, I was concerned. I have made recipes from you before and have loved every one but the idea of pumpkin, chipotle, apples, chorizo, and cheese in one bowl of soup had me worried that this was a flavor combination that would just be too weird to eat more than one serving of. To those of you who haven’t tried it, NEVER FEAR. I’m pretty sure my hubby and I licked our bowls on more than one occasion of eating (between the two of us) every single drop of this soup. Which was a lot of soup, because I had taken the risk and doubled the recipe. In summary, this soup was AMAZING and so unique. We’ve never eaten anything like it. But it was par for the course for this blog. Your recipes are delicious and I can’t wait to make this soup again. Thanks for such an awesome comment and again, so happy you love this soup! Here is my silly little question. I plan to make this this evening for my husband and myself (we are carving pumpkins tonight!!!!) and I wanted advice on what to serve with it. Of COURSE warm, crusty bread of some sort. But do I also serve a side salad? What do you serve with this soup? HI!! I think a side salad would be perfect! Maybe an apple or pear salad?? Hope you both love the soup!! 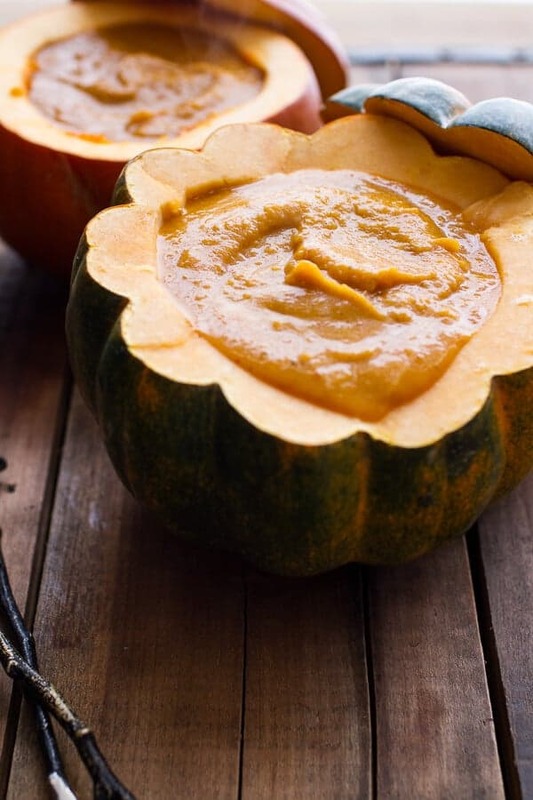 I know I’m late to the party, but I just pureed my pumpkin and thought this looked delicious… But my grocery store does not have adobe peppers! What is good substitution? haha! Thanks! Hope you love the soup!!! Wondering how this soups freezes? Think it would work to puree the apples into the soup for freezing? Thanks. I was looking for an unusual soup to make for Thanksgiving. I found this recipe and even though I was a little skeptical about the combination….I decided to give it a try. Well…Let me tell you…this soup is awesome! I cut back on the cheese a little but it still tasted great. I caramelized the apples, cooked the chorizo and in the chorizo oil…I toasted some pepitas (pumpkin seeds). I really think the pepitas added alot. The Sweet apples with spicy chorizo and then a little crunch from the seeds. Everyone LOVED it! I liked it so much that I made another batch with fat free half and half and it is still really good! That is so awesome! I am really glad you enjoyed this and your additions sound great! Thank you! Hi–I have canned pumpkin and I have diced butternut squash. 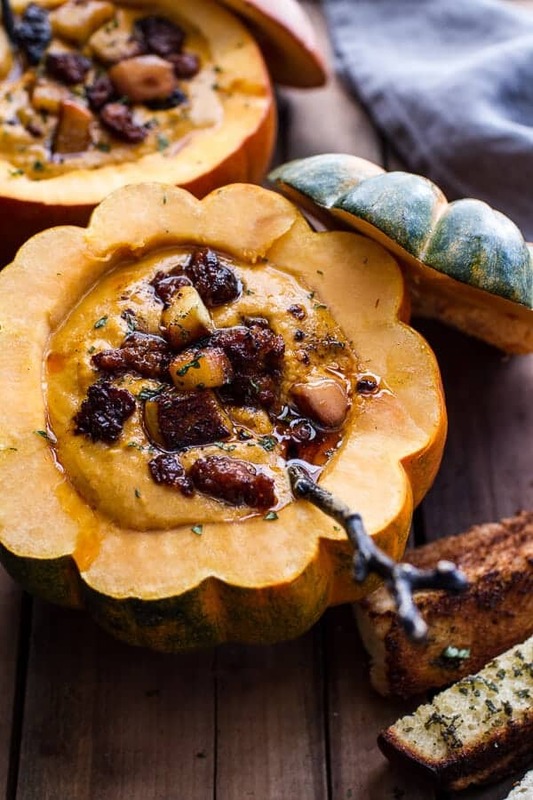 Will the flavor be altered too much if I use the butternut squash? Can’t wait to make this!